This short booklet is great for explaining the basics of salvation and the Christian life. Topics include assurance of salvation, answered prayer, victory over sin, forgiveness, and guidance. This inital follow-up tool may be just what you need to help someone get off to a good start as a follower of Jesus Christ. The text can be read in only a few minutes, but it covers all the bases and gives plenty of Scripture references. The booklet includes tear-out Scripture memory cards with key Bible verses in both KJV and NIV. It's the perfect way to introduce new believers to the Topical Memory System without overwhelming them. 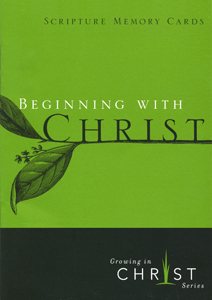 Available in packets of 10, Beginning With Christ is the first resource in the Growing In Christ Bible study series. Designed for new believers, it may be used alone or with the workbook Lessons on Assurance. With the included Scripture memory cards, you'll experience the blessing of hiding God's Word in your heart!